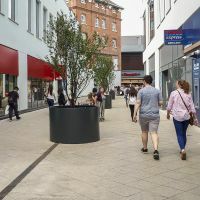 Bespoke aluminium tree planters were commissioned for the retail-led expansion of The Brewery Quarter, in the heart of Cheltenham town centre. The planters were manufactured from 3.0mm thick Aluminium, with a Polyester Powder Coated [PPC] finish to RAL 7016 [Anthracite grey]. The planters were cylindrical in shape, Dia. 1500 x H 1000mm, and including tree root ball attachment points.